Reading is key to the curriculum and a hugely important life skill so that is why reading at Windy Nook Primary School has an enormous emphasis put on it. On entry the children are taught to read through a systematic and structured approach based around Read Write Inc Phonics. From that initial starting point the children then go on to read a range of texts, both fiction and non-fiction, to give breadth and balance in developing their independent reading skills. ‘Must Reads’ – these are a set of quality classic and contemporary texts that are age appropriate for each phase throughout the school. They are shared with the children at story times and as ‘reading for enjoyment’. Whole class reading comprehension – as the children develop their basic reading skills and become more fluent whole class lessons with a reading comprehension focus look at, for example, inference and deduction. These are teacher led lessons with peers supporting each other. Reading Interventions – to give those children who may need an extra boost with their reading we have put in place BRP (Better Reading Partnership) and FFT (Fischer Family Trust) where and when reading intervention is required. Reading Plus – is a reading program used by Year 5 and Year 6 pupils. School libraries – we have two school libraries which operate on a simple borrowing system and are run by Upper Key Stage 2 pupils. 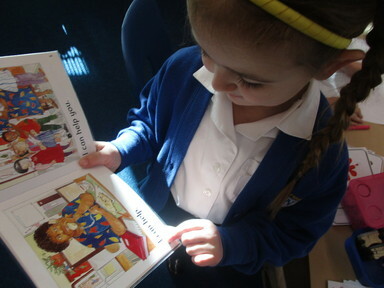 This is to promote a love of reading from an early age and give the children access to a range of texts free of charge. This powerpoint presentation will give you lots of information about RWI Phonics.